Jacob Tremblay began acting in 2010 when he was featured in several national and international commercials. At five years old, he quickly transitioned to the big screen when he booked his first audition for film or television and was cast in Raja Gosnell’s Smurfs 2. In the film, Jacob plays the young son of Neil Patrick Harris and Jayma Mays. Following that he went on to supporting roles in the television shows like Motive for ABC and Mr. Young for Disney and a supporting lead role in the television movie My Mother’s Future Husband. In early October of 2017 it was revealed that the young actor had written a zombie screenplay. His new film, Wonder, opens on November 17. 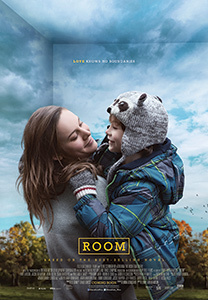 Poster for the 2015 film Room, courtesy of Elevation Pictures.